In the 1980’s, Voyager 1 and Voyager 2 flew past Saturn, collecting data and snapping lots of photos to send back to Earth. One of the features discovered during that mission was a near prefect hexagon-shaped cloud formation at Saturn’s north pole. In 2009, the Cassini spacecraft confirmed that the hexagon was still there, apparently unchanged after 30 years, and began collecting more data and taking more pictures. Similar hexagonal standing waves have been created in the laboratory. Researchers also created ovals, triangles, octagons, and other shapes using standing waves, suggesting that there may be more planets out there with geometric cloud formations in their atmospheres. But the really important thing to know is that, based on infrared imagery, it appears the hexagon is rooted deep into Saturn’s interior structure. The hexagon’s rotation may directly correspond to the rotation of Saturn’s presumably solid, possibly metallic core. If that’s true, then the hexagon may provide planetary scientists an easy way to study Saturn’s interior, and perhaps a way to learn about the interior structures of gas giants in general. 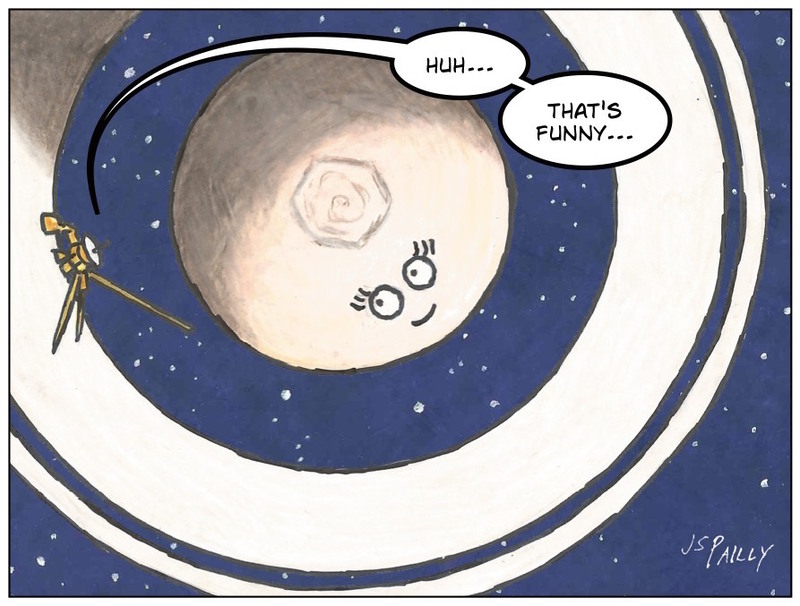 All thanks to a rather odd, rather funny observation of Saturn’s north pole. Saturn’s Hexagon Recreated in the Laboratory from the Planetary Society. Science Shot: Mysterious Hexagon May Reveal Length of Saturn’s Day from Science Magazine. Posted by J.S. Pailly on September 24, 2015 in Mission to the Solar System, Saturn (2015 Mission). Yeah, they saw our military’s pentagon, and decided to show us up. Yes… That must be what happened.